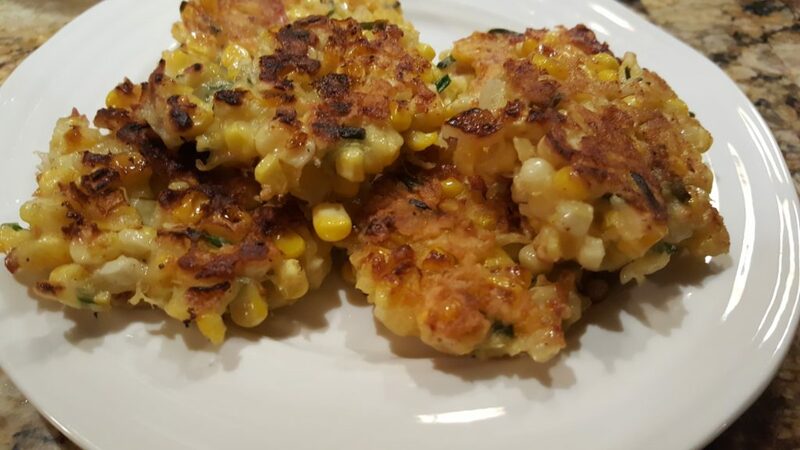 These corn fritters are amazing when made with fresh, sweet corn, but even frozen corn can be used to bring some summer sunshine to a winter meal! Optional: finely chopped sweet onion, finely chopped jalapeno pepper, etc. Remove corn from the cob by standing cob upright in large pan or plate. Use a sharp knife to cut the kernels off the cob, then run the back of the knife up & down the cob to remove the ‘milk’ (small pieces and juice still on the cob). Repeat with remaining cobs. Add chopped green onions, cheese, herbs & seasonings. Stir & taste. Add more salt and pepper if needed. Add eggs and stir again. Add 1 cup of flour and stir thoroughly to combine. Heat 2-3 tablespoons of oil in a large frying pan over medium heat. When oil is hot, add small scoops (1-2 tablespoons) of batter and gently press to flatten a bit. Batter will be sticky, but if too sticky it’s OK to add a bit more flour. Watch closely as fritters will cook quite quickly. Flip gently when bottom of fritter is golden brown. Cook other side til done. Remove and drain on paper towel. Add oil as needed to cook the remaining fritters. Serve as soon as possible. Leftover fritters can be refrigerated up to 3 days and reheated in a fry pan or oven at 350 degrees. They can also be frozen, thawed and reheated! Serve as a delicious side dish with meat or a salad. They can also be served with homemade aioli, such as our Olive Us Chipotle aioli. Check our other recipes & ideas! Makes about 24-30 small fritters.